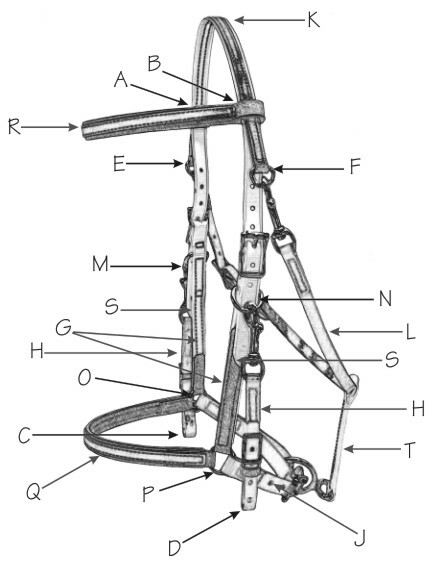 Note: For your reference, this chart has included additional information on the parts of a bridle/headstall. The browband and headstall lengths are the most important measurements needed for sizing a piece of tack. To accurately obtain the correct dimensions, measure an existing properly fitting bridle/headstall. Do not measure the horse. If you do, your measurements will be inaccurate. The directions below and the chart above should assist you in acquiring these correct measurements. Browband Measure the distance from the front edge (sew line) of the crown, across to the front edge on the other side (A - B). Bridle length Measure the distance from the fold where the bridle connects to the bit on one side, over the crown, to where the bridle connects to the bit on the other side (C - D). It is best to measure the parts flat and in sections for accuracy. Please do not measure on a curve. Measuring on a curve will add an undetermined length. Throatlatch Measure the total fitted length (EKFL) - includes upper throatlatch (EKF) and lower throatlatch (ELF). Noseband Measure the total fitted length. 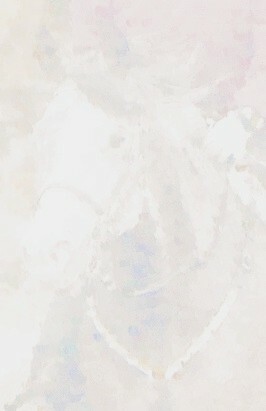 Please do not measure the nose of the horse (J). Measurements below are the fitted measurements - smallest to longest fit (S-L) on the left and best fit on the right (B F). 40 1/2" - 43 1/2"
Bit Hangers Fitted length including snap - 7 1/2" - 9 1/2"
Bit hangers can be shortened to 6" by cutting off 5 holes. Other sizes are custom orders.